Each one has a story. Some have a happy endings and some have sad ones. All of them deserving attention and care. We love every chicken we rescue here at Chicken Heaven On Earth Rescue Sanctuary. Each and every one of them have distinct and different personalities which can steal your heart at the very sight of them. Most of the rescued chickens we get at Chicken Heaven On Earth are roosters and hens who were previously pet chickens or backyard chickens, many were house pet chickens so they need lots of attention every single day. Though I try to integrate them into the flock and encourage them to learn natural chicken behaviors, many still crave human interaction, so most days after chores, I spend sitting on the ground, talking to and petting chickens. To me, they are like children who need care, encouragement, and love every single day. We pray for happy endings for all of our rescues and private stock chickens here at CHOE. 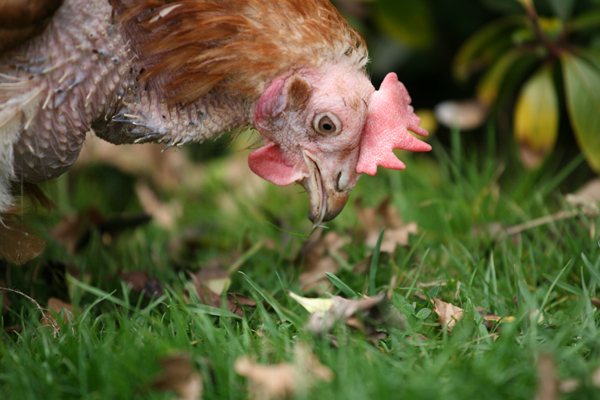 ​​Each week we feature a new true rescued chicken story. Scroll down to see more rescues and pictures and stories of recent rescued chickens. We are now featuring chickens rescued by other people and sanctuaries as well. 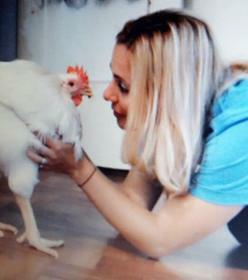 ​True stories and videos of rescued chickens! New updates on Meet Mr. Parker rescued rooster, rescued hen Lady Silkie and Lady Frizzle. 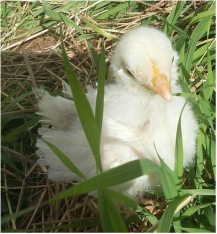 See Penelope the hen rescued from bizarre religious rituals, Lil' Man-The Weekly Crow Icon's rescue, battery hen rescues, rescued rooster's, rescued hens, rescued baby chicks, rescued ducks, and more! Goldie: Sole survivor of Cat Attack sharing a ice cream sandwich with me. There are new updates and pics of Goldie-you may remember her, she is the first Buff hen we ever rescued, Goldie watched from her hiding place as a cat killed her sister's and brother's and she survived without injury but her owners were worried and brought her to us. Rescued hen named Penelope and her loving owner who saved her from certain abuse and death. Penelope was rescued and overcame huge obstacles, it did not seem like she would survive the horror she had endured but with the love and attention she received, Penelope the rescued hen not only survived, she thrived. Watch this inspiring video of Penelope the chicken rescued from a horrifying religious ritual held annually in New York and other places by Orthodox Jews. Be sure to sign the petition to stop this horror. Foghorn the Rooster Lost His Feet to Frostbite & Gets New Feet! Peepers at his new home with his pretty hens. Peepers is a very special little rooster, not only was he actually born at Chicken Heaven On Earth with a rescued rooster and a rescued hen as his parents, but he was also adopted and now has a happy home with several beautiful hens to keep him company. CHOE found a happy home for Peeper's. Mr. Parker is a beautiful rooster, though we do not know what breed he is for sure, this handsome guy was brought to our sanctuary and his awesome docile and friendly personality has endeared him to me and the flock. Penelope the hen, a young broiler chick was crated and about to be offered up to be a sacrifice in a religious ritual called Kaporos, when one brave soul grabbed her and ran with her. Meet Lady Frizzle-Survivor of Abuse and a Skunk Attack! Lady Frizzle (rescued by Chicken Heaven On Earth) was a victim of pecking from larger birds and attacked by a skunk but this little girl beat the odds and made a 100% recovery! Video and pics. Since her recovery Lady Frizzle fell in love with Mr. Snowie and they just had their first baby chick! We named her Lil' Snowball. After his dramatic recovery..he became the Mascot for The Weekly Crow and lived many happy years with lots of hens free ranging at Chicken Heaven On Earth SAnctuary. Five little chicks found drowning in bread dough-CHOE fighting to save them-and they all survived! With video and pics. The Doughboys fight for life & win! Sweet Rhode Island Red rooster named Dexter who had to leave his home because city ordinances would not allow him to stay. His former owner said he had heart problems and faints when he gets scared. Barred rock hen rescued with her sister Missy are now veteran hens who rule the roost at Chicken Heaven On Earth. 1 Pocket Gopher named Bubbasita-was injured had only one eye, made a full recovery and was released on CHOE property. He still pops out of the ground hole for treats! 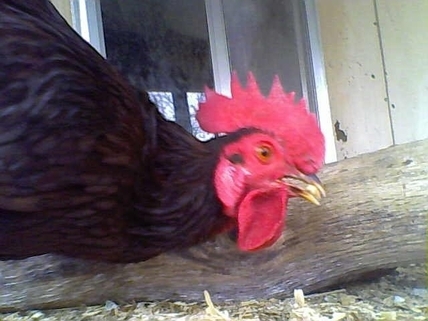 Buttercup (Rhode Island Red Rooster) can be seen on Youtube. Donkey-up for adoption-Adopted. Shrek the Donkey has been adopted. August 2018 and has a new home with more acres to roam and protect. Rescued Spent hens-up for adoption. These hens older than 2 years old who were brought here by their owners who no longer wanted them because their egg production was no longer up to par. 10 rescued roosters-tame-up for adoption now.